Sweden is introducing a new climate law promising zero greenhouse gas emissions by 2045 and a 70% cut to emissions in the domestic transport sector by 2030, effective January 1, 2018. With a strong commitment to the Paris Agreement, Sweden is already one of the most climate change-conscious and sustainable countries in the world. India, the world’s third-largest emitter of greenhouse gases, has committed itself to an increased clean energy share by 40% by 2022. 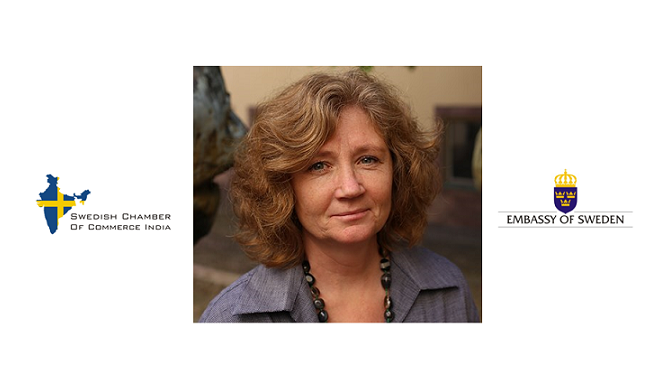 The Swedish Chamber of Commerce India in collaboration with the Embassy of Sweden invites you to an interactive meeting with Ms. Eva Svedling, State Secretary for Climate Policy, Ministry of Foreign Affairs, Government of Sweden. Join us for to hear about Sweden’s commitment to working progressively to combat climate change, the status of the Paris Agreement and the current global challenges. We invite you also to present the work being done by your company towards being environmentally responsible. Seats are limited so ensure you book yours and arrive on time.